Check you have sufficient fuel to get through the tunnel. If a Toll charge is indicated ensure you have the means to pay. Check that your vehicle is roadworthy and the engine/brakes are not overheating, nor emitting excessive exhaust fumes. Check all loads are safe and secure and comply with maximum width, height, and weight restrictions before entering the tunnel. Take due note of any signposted restrictions with regard to the transportation of dangerous or hazardous goods. If a preferred radio frequency is indicated on approach signage, re-tune your radio. Recommended driver behaviour whilst driving through a road tunnel. Take off sunglasses upon entering. Observe all traffic signs, speed limits and road markings. Use headlights (not full beam) if conditions or regulatory signage dictate. If driving a HGV leave a 4 second gap between you and the vehicle in front. Do not overtake or change lanes unless directed to do so by a sign or Police / Traffic Officer‘s instruction. Never perform a U turn inside a tunnel or move in a reverse direction. Recommended driver behaviour in congested conditions within a tunnel. 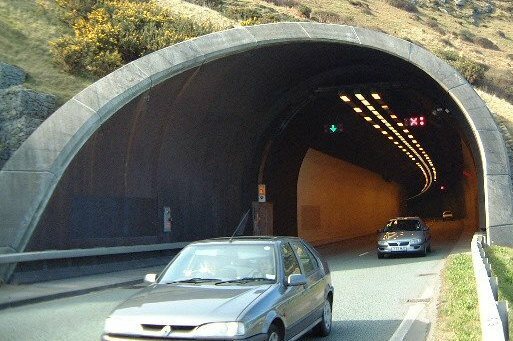 If you stop in a tunnel due to congestion or a breakdown leave at least a five- metre gap between yourself and the vehicle in front. Switch off your engine if traffic is completely stopped. Listen for possible messages over the radio. Follow all instructions from lane control or variable message signs. Recommended driver behaviour in the event of a breakdown or accident (own vehicle). In an urban ‘manned‘ tunnel, traffic controllers will spot you via CCTV and direct assistance to you. In such instances drivers should stay with their vehicle. In a rural ‘unmanned‘ tunnel, leave your vehicle, and using the sidewalk, call for help from an emergency point phone. If the tunnel has an emergency lay-by, and it is possible for you to pull in from the main traffic flow, do so. Do not attempt to push your vehicle or change a wheel in the tunnel. Wait for assistance from a Police/Traffic Officer. Recommended driver behaviour in the event of a fire in your own vehicle whilst in a tunnel. If at all possible drive your vehicle out of the tunnel before stopping. If that is not possible stop the vehicle, and turn on your hazard warning lights. Switch off the engine, but do not lock the vehicle. Evacuate onto the sidewalk. Never attempt to U turn your vehicle or reverse out of the tunnel. Try and move the vehicle to the hard shoulder if one exists. Raise the alarm by using either the nearest emergency phone or alarm button. If possible use an extinguisher from the emergency point to fight the fire. If it is not possible to fight and extinguish the fire move swiftly to the nearest signposted emergency exit (indicated by a green ‘running‘ man). Obey all instructions from Police/Traffic Officers including those via radio rebroadcast interrupt, public address system or illuminated evacuation signage. Recommended driver behaviour in the event of a fire in another vehicle whilst in a tunnel. Do not hinder a burning vehicle from driving out of the tunnel. If another vehicle shows unusual smoke switch on your hazard warning lights and try and alert them. If forced to stop, ensure you maintain as much distance as possible between yourself and the smoking or burning vehicle. Never attempt a U turn or reverse out of the tunnel. Try to help, if possible, to extinguish the fire using extinguishers or hose reels from the nearest emergency point.